Dr Craig Hardner holds a bachelor in Forest Science awarded by the University of Melbourne, and BSc (Hons) and PhD from the University of Tasmania. Prior to his PhD Dr Hardner worked as a Research Fellow at Swedish Agricultural University 1988-1990 supporting willow breeding for energy production. Between 1996-2007, Dr Hardner lead the CSIRO macadamia breeding program. 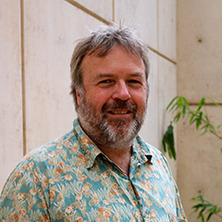 Dr Hardner joined the University of Queensland in 2007 and commenced a joint appointment with QDPI as a research fellow in horticulture breeding and genetics. He has an extensive collaboration network in horticulture breeding and conservation including domestic and international organisations and Universities. Dr Hardner was lead author on a 128 page review of macadamia genetics and domestication published in 2009 and is curator of macadamia cultivar descriptions for HortScience. He was awarded a Churchill fellowship in 2012 to travel to Hawaii to trace the domestication pathway of macadamia. I am a world leader in development and application of mixed model methods for prediction of genetic value in forestry, macadamia, sugar cane, mango, and apple. In particular, I am interested in use of multi-variate approaches to model complex experimental designs including multiple locations, repeated measures, and spatial variation, and genetics including individual, parental, non-additive variation and polyploidy. I am also developing approaches for using genomic relationship matrices to leverage historical breeding and variety testing data to expand knowledge of GxE in horticultural crops. Macadamia is an iconic Australian genus, being the only international crop domesticated from Australian flora. My research in this area uses sequencing and molecular markers to improve understanding of structure of remnant wild populations and trace the domestication history of the major sources of germplasm utilised for commercial production. This research also investigates opportunities available for breeding from utilisation of the remnant wild resources. I published a 128 pages seminal review of macadamia genetics and domestication in 2009. I have major research activity in the quantitative genetics and breeding of perennial crops. I have an extensive background in genetic improvement of eucalypt and macadamia crops.I bred and selected new macadamia cultivars targeted specifically to Australian industry that will be released in 2017, and continue as a co-principal investigator on the current breeding program with responsibility for genetic analyses, evaluation of alternative breeding strategies and estimation of economic weights for selection. Dr Hardner is responsible for developing new macadamia cultivars selected specifically for Australian production systems, promising a 30% increase in productivity. He also leads research on tracing the domestication of macadamia and identifying the wild origin of domesticated cultivars to further improve knowledge of the cultural history of the plant. He initiated, and is a member, of the Macadamia Conservation Committee which brings together Australian industry, university researchers, government officers, and NGOs to develop and support strategies for conservation of macadamia in the wild. Dr Hardner has developed statistical approaches, and software for implementation, to improve prediction of genetic value of selection candidates in sugar cane, apple and eucalypts. His research on analysis of alternative breeding strategies has contributed to more efficient breeding strategies for macadamia, apple, eucalypts and strawberry. Dr Hardner is working with international researchers to use genomic approaches to combine historical data collected previously on varieties planted in different locations to improve understanding of the GxE to underpin improved production efficiency through better matching of genotype and production environment. This work will also be used to improve adaption strategies under the effects of climate change. This study is part of a large international collaboration that I lead. The approach is to examine the success of using genomic data to combine existing data previously collected by field evaluation programs to improve understanding of genotype and environment matching and improve strategies for dealing with the impact of climate change. crops include apple, peach, strawberry, cherry, macadamia and possibly mango. This study will undertake historical research and use molecular approaches to better understand the different sources of macadamia germplasm introduced into Hawaii, California and South Africa during the 20th century and how that contributes to the currently utilised commercial cultivars. Hardner, C. and Topp, B. (2018). Macadamia integrifolia and M. tetraphylla. In Lee Thomson, John Doran and Bronwyn Clarke (Ed. ), Trees for life in Oceania: conservation and utilisation of genetic diversity (pp. 147-151) Canberra, ACT Australia: Australian Centre for International Agricultural Research. Hardner, Craig M., Peace, Cameron, Lowe, Andrew J., Neal, Jodi, Pisanu, Phillip, Powell, Michael, Schmidt, Adele, Spain, Chris and Williams, Kristen (2009). Genetic resources and domestication of macadamia. In Jules Janick (Ed. ), Horticultural reviews (pp. 1-125) Hoboken, NJ USA: Wiley-Blackwell. Hardner, C. (2010) Macadamia. Hortscience, 45 730-731. Alam, Mohammad, Wilkie, John, Kelly, Allison, Hardner, Craig and Topp, Bruce (2017). Genetic diversity and variability in graft success in Australian macadamia rootstocks. In: International Macadamia Research Symposium, Hawaii, United States, (). 13-14 September 2017. Alam, Mobashwer, Hardner, Craig, Nock, Catherine, O'Connor, Katie and Topp, Bruce (2017). Historical and molecular evidence of genetic identity of 'HAES741' and 'HAES660' macadamia cultivars. In: International Macadamia Research Symposium, Hawaii, United States, (). 13-14 September 2017. O'Connor, Katie, Hayes, Ben, Hardner, Craig, Mobashwer Alam and Topp, Bruce (2017). Indirect prediction of macadamia yield through a genome wide association study of component traits. In: International Macadamia Research Symposium, Hawaii, United States, (). 13-14 September 2017. Topp, Bruce, Hardner, Craig, Alam, Mobashwer, Akinsanmi, Olufemi, O'Connor, Katie, Mai, Thuy and Russell, Dougal (2017). Opportunities and challenges in macadamia breeding. In: International Macadamia Research Symposium, Hawaii, USA, (). 13-14 September 2017. Wei, Xianming, Jackson, Phillip, Hardner, Craig, Parfitt, Roy, Atkin, Felicity and Piperidis, George (2017). Parental improvement in the SRA sugarcane breeding program. In: 39th Conference of the Australian Society of Sugar Cane Technologists (ASSCT 2017). 39th Conference of the Australian Society of Sugar Cane Technologists (ASSCT 2017), Cairns, Australia, (288-295). 3-5 May 2017. Mai, Thuy, Alam, Mobashwer, Henry, Robert, Hardner, Craig and Topp, Bruce (2017). Prospects of utilizing wild germplasm for future improvement of macadamia. In: International Tropical Agriculture Conference TropAg2017, Brisbane, Australia, (69). 20-22 November 2017. Mai, Thuy, Alam, Mobashwer, Topp, Bruce, Hardner, Craig and Henry, Robert (2017). Searching for extended variability in nut characteristics in wild macadamia gene pool. In: International Tropical Agriculture Conference TropAg 2017, Brisbane, Australia, (69). 19-20 November 2017. Nock, C. J., Baten, A., Hancock, W., Kawamata, A., Craig Hardner, Bruce Topp, Robert Henry and King, G. J. (2014). In Harvesting the macadamia genome. In: Plant and Animal Genome XXII Conference, San Diego, (). 11-15 January 2014. Hardner, C. M., Bally, I. and Wright, C. (2013). Prediction of breeding values for average fruit weight in mango. In: P. Lu, IX International Mango Symposium. IXth International Mango Symposium, Sanya, Peoples Republic of China, (245-250). 8-12 April 2010. Hardner, Craig and Peace, Cameron (2009). A review of the genetic improvement of macadamia: An Australian icon. In: Edilberto Redona, Proceedings of the Joint 14th Australasian Plant Breeding Conference and 11th SABRAO Congress. 14th Australasian Plant Breeding Conference (APBC) and the 11th Congress of the Society for the Advancement of Breeding Research in Asia and Oceania (SABRAO), Cairns, Australia, (1-14). 10-14 August 2009. Hardner, C. M., Greaves, B., Coverdale, C. and Wegener, M. (2006). Application of economic modelling to support selection decisions in macadamia. In: Mercer, C. F., Breeding for Success: Diversity in Action: Proceedings of the 13th Australasian Plant Breeding Conference. 13th Australasian Plant Breeding Conference, Christchurch, New Zealand., (). 18-21 April, 2006. Schmidt, A., Neal, J., Hardner, C. M. and McConchie, C. A. (2006). Development and application of micro-satellite markers for macadamia. In: R. Drew, Tropical Crop Biotechnology Conference, TCBC 2006. 1st Tropical Crop Biotechnology Conference, Cairns, Australia, (). 16-19 Aug 2006. O'Riordan, P., Baxter, I., McConchie, C., Hardner, C., Albertson, P. and Williams, E. (2005). Consumer sensory preferences for macadamia nuts. In: D.J. Tanner, Acta Horticulturae: Proceedings of the International Conference Postharvest Unlimited Downunder. International Conference Postharvest Unlimited Downunder 2004, Sydney, Australia, (99-105). 9-12 November, 2004. Hardner, C. M., Peace, C, Henshall, J. and Manners, J. (2005). Opportunities and constraints for marker-assisted selection in macadamia breeding. In: R. Drew, Acta Horticulturae: Proceedings of the International Symposium on Harnessing the Potential of Horticulture in the Asian-Pacific Region. International Symposium on Harnessing the Potential of Horticulture in the Asian-Pacific Region, Coolum, Queensland, Australia, (85-90). 1-3 September, 2004. Raspel, J., Bradley, D., Wilkie, J.D., Hardner, C., Forrester, B. and McConchie, C. (2001). Effects of temperature and time on kernel quality following wet nut-in-shell storage. In: Australian Macadamia Society Limited 2001 Conference Report. AMS 2001 Conference and Annual General Meeting, Tweed Heads, NSW, (49-49). 25-27 October, 2001. Peace, C. P., Hardner, C., Brown, A. H. D., O'Connor, K., Vithanage, V., Turnbull, C. and Carroll, B. J. (2001). The diversity and origins of macadamia cultivars. In: Australian Macadaamia Society Limited 2001 Conference Report. AMS 2001 Conference and Annual General Meeting, Tweed Heads, NSW, (34-37). 25-27 October, 2001. Peace, C., Hardner, C., Vithanage, V., Carroll, B. J. and Turnbull, C. G. (2000). Resolving hybrid status in Macadamia. In: H.S. Dungey and M.J. Dieters and D.G. Nikles, Hybrid Breeding and Genetics of Forest Trees. QFRI/CRC-SPF Symposium, Noosa, Queensland, (472-476). 9-14 April, 2000.